This insane, I cannot believe it is happening. By signing that QO he is betting on himself so we will at least have him for a year. Ok waiving Salah is werid. We kinda need centers. On the other hand: MAXIIIIIIIIIIIIIIIIIIIIIIIIIIIIIII. Good luck with that i live here in ny and it crazy right now. Dang...was looking forward to seeing him get minutes. I immediately thought of Mo Salah and was like wait what did Liverpool do? Hahaha. @ShamsCharania: Porzingis is incredibly fond of Dirk Nowitzki and Luka Doncic -- and the Mavericks have confidence they will be able to keep Porzingis, league sources said. Knicks/Mavericks talks started picking up steam Wednesday night. Porzingis is incredibly fond of Dirk Nowitzki and Luka Doncic -- and the Mavericks have confidence they will be able to keep Porzingis, league sources said. Knicks/Mavericks talks started picking up steam Wednesday night. Wait I didn't see anything about waiving Salah. Oh well. Youth movement! Mavs are including TWO future first-rounders in this trade. KP is signing that max contract this summer. Luka is such a team player. He even was willing to have his worst game of the season to make DSJ look as good as possible against the Knicks to execute this trade. Hardaway is trash....he is basically the SG version of Barnes, just worse. So he eats 18m in cap this summer and next summer. Not really a bad deal for NY tbh. They got rid of two bad contracts. A young pg (DSJ) with potential. And now have tons of cap space for free agents. Don't think of cap space in N.Y. being the same as cap space in Dallas. They should have much more success than us in getting guys to sign there. A blank slate for the new management. I hope those two picks are heavily protected... that's actually a lot. Looking more like a win-win for both sides now. NYK has youth, tons of picks and two max slots. Dallas a playoff contender with a healthy KP. But yeah, incoming euro superteam....Giannis joining in 2021. Last edited by sefant77; 01-31-2019 at 05:30 PM. Cost of doing business -- we now have a Luka/Porzingis core to unleash hell on the NBA. Disagree, it's a terrible deal for NY. Losing Porzingis was the one thing they could not afford to do. Jackson was alienating Porzingis, even before Jackson was axed. Mills/Perry alienated his management (family). Pretty sure there will be another coach in NY withing the next 2 years, and Porzingis wanted no part of it. Cap is severely overrated. It's potential-- potential that is rarely used unless you overpay. Striking out can also make you overpay anyway because of league minimum salary. I like that we still have a max contract for a young guy (less than 6 years in the league) to offer. That gives me hope we can get another big fish or a few small fishes. I would like to give a big shout out too all of the posters here who's names I've never seen. As a guy that very rarely posted years, it's good to see all of you. Also not worried about the two 1st picks becaue by time they go to NY we should be really good and it won’t matter. I've been pretty low on Donnie for the past several years, but man, between trading up for Luka and now this... yeah, Donnie has had one hell of a year. Last edited by Thespiralgoeson; 01-31-2019 at 05:48 PM. I haven’t read all of the posts here so excuse me if someone already mentioned this. 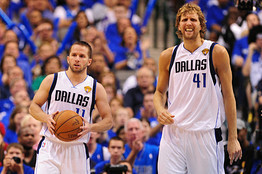 The Mavs now have 2 franchise players. With that in mind how crazy is it to think that the Mavs would have an outside chance at luring KD to Dallas? He’d fit perfect between Luka and KP. He would have a legit shot at a title. It would improve his reputation because he would be coming to a team that would be trying to beat LA and Golden State. He also likely still has a large fan base from his days in OKC. We're gonna be better than we were, DSJ and Matthews tanked our starting lineup, they were the main reasons why it was literally the worst five-man unit in the NBA. I fully expect the team to make a run at the playoffs once Luka and the bench lineup meshes. Ha, they'll end up with a maxed Demarcus. I am shocked right now. No way I thought the Knicks would trade KP to Dallas this season. Jordan is a huge loss on the boards. Even if Porzingis comes back immediately and plays 40mpg, our frontcourt is going to be terrible rebounding. Barnes+ Porzingis is going to get outrebounded by 20 a game. Honestly think that Brunson starting is a huge upgrade who can facilitate without dominating. Burke is going to be a sparkplug like Barea. If we get some contributions from THJ or Lee, I will be surprised, but happy. I still think that in my best case scenario, they go .500 the rest of the way and that is extra rosey. Most likely Porzingis is held back for two weeks and comes back after the allstar break, and plays no more than 15-20mpg for the remainder of the season. We also have zero time to replace three starters with no training camp so I think it's going to look really rough. We have 31 games left-- 30 once the trade is complete. That's not a lot of time to get a team playing well. Last edited by EricaLubarsky; 01-31-2019 at 06:13 PM. I’m not too worried. Players come back from ACL injuries all the time. Plus we have the best trainer in the NBA in Casey Smith who has to give the OK after the physical. We just landed a top 20 player. So I heard the Mavs did something neat today. "I say 'Hey Lama, how about a little something ya know', for the effort?' And he says 'oh, there won't be any money, but when you die, on your deathbed you will receive total consciousness.' So I got that going for me...which is nice." Barnes got an assist. Neat, right?